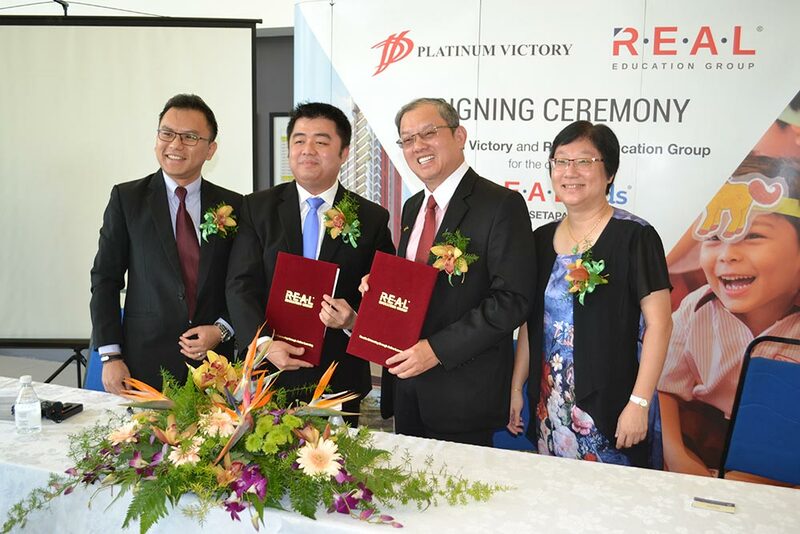 In line with its aim of ‘Transforming Lives in Every Community through Learning’, R.E.A.L Education Group officially signed an agreement with Platinum Victory Development recently to open a new R.E.A.L Kids centre in Setapak, Kuala Lumpur. Located within the premises of PV21 Platinum Lake Condominium, R.E.A.L Kids Setapak is slated to open in August this year. In a simple but significant signing ceremony held on 22nd March 2017, the event marks a milestone for two major players within their respective industries; with R.E.A.L Kids being one of the country’s leading preschool education providers while Platinum Victory Development being one of the country’s premier property developers. The agreement was officiated by Mr. Gary Gan Kah Siong, Director of Platinum Victory Group (2nd from left) and Mr. Ee Ching Wah, President of R.E.A.L Education Group (2nd from right); while being witnessed by Mr. Pang Cheng Wei, Senior Legal Manager of Platinum Victory Group (far left) and Ms. Rachel Leow, General Manager of R.E.A.L Kids. At the ceremony, Mr. Pang remarked, “Having a quality early childhood education provider like R.E.A.L Kids on board is definitely beneficial to our residential community. With many young families calling this place home, the convenience of preschool education right at their doorstep and within a stone’s throw of SRJK (C) Wangsa Maju would surely add value to their overall quality of life”. “In fact, this is the first time we are partnering with a preschool provider to open a centre within one of our residential projects. Therefore, we are pleased to have a homegrown brand like R.E.A.L Kids which would help strengthen our footing as a premier developer of choice through building, caring and growing together. Hence, this collaboration would complement both parties in realising common goals in terms of exploring new possibilities and catering to the evolving needs of our customers,” he added. Meanwhile, Mr. Ee commented, “The coming together of both R.E.A.L and Platinum Victory is a fitting and mutually-beneficial partnership. It is a relatively unique concept for an established preschool education provider to open a centre within a condominium complex as most of our centres are purpose-built and located on landed properties. This exciting collaboration has also opened the door for R.E.A.L to expand into the Setapak market for the first time”. “With Platinum Victory being a market leader by virtue of its significant presence in Setapak, this venture is indeed an ideal proposition for both parties as we seek to meet our respective customers’ needs. By always having this end in mind, it is our customers who would ultimately benefit,” he added. Mr Ee also commended Platinum Victory for having the foresight to offer education as one of its range of condominium services and also expressed his desire and determination for R.E.A.L Kids to bring ‘excitement’ into the Setapak preschool market.